Hans Urs von Balthasar, in his Theo-Drama IV: The Action, has an excellent (beware, Balthasar is deep!) explanation of the relationship between the persons of the Trinity. For him, life in the Trinity is the starting point of all theology. In explaining the life involved inside the Trinity, von Balthasar centers on the “generation of the Son” by the Father. This, to him, is the starting point of the Trinity; it explains and reveals everything else. Balthasar explains the “generation of the Son” as the eternal action of God the Father in giving of himself in love. Because God is love, he is constantly pouring himself out in love. As a result, this pouring of oneself out demands a Beloved — this beloved One is the Son, who is eternally begotten as a result of the Father’s eternal love. So, God the Father’s outpouring of love eternally generates the Son. And this outpouring is such that the Son is eternally begotten, and other than of the Father (other in Person, one in substance). And so, God the Son, as God the Father’s beloved, is consubstantial with the Father. von Balthasar describes this outpouring as the “kenosis” (emptying of oneself) of God the Father. He gives of his divinity, empties himself, such that the Son is equal with the Father as a result of that love. It follows that the Son, for his part, cannot be and possess the absolute nature of God except in the mode of receptivity: he receives this unity of omnipotence and powerlessness from the Father. This receptivity simultaneously includes the Son’s self-givenness… and his filial thanksgiving (Eucharist) for the gift of consubstantial divinity. What Balthasar explains is that as the Son receives this “powerless” outpouring, this kenosis, of God the Father, he cannot help but give of himself in an act of eucharistia (thankfulness). And so, the Son pours of himself in kenosis back to the Father. Thus, the Father and the Son give of themselves to one another eternally. Consequently, this expression of kenotic love between the Father and Son is the Holy Spirit. He is the unity of love between the Father and Son. So this is the life of the Trinity. It is a Lover, a Beloved, and Love which seals the two. We may call the Trinity a kenosis of love. For each person empties himself for the other. 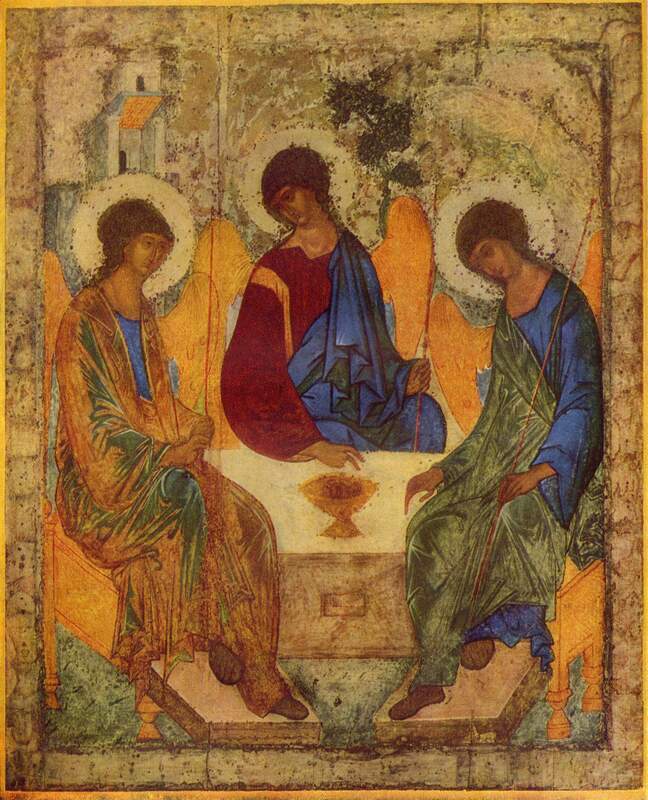 The Trinity is radically other-centered. The Father gives, the Son receives and gives, the Spirit seals and glorifies the other two. von Balthasar goes on to explain that this doctrine of the kenotic Trinity is the starting point for the rest of Christian doctrine. The doctrines, broadly, of creation, covenant, and cross, are all seen as coming from the Trinitarian life of God. This primal kenosis (Trinitarian life) makes possible all other kenotic movements of God into the world; they are simply its consequences. The first “self-limitation” of the triune God arises through endowing his creatures with freedom. The second, deeper, “limitation” of the same triune God occurs as a result of the covenant, which, on God’s side, is indissoluble, whatever may become of Israel. The third kenosis, which is not only christological but involves the whole Trinity, arises through the Incarnation of the Son alone: henceforth he manifests his eucharistic attitude (which was always his) in the pro nobis [for us, in place of] of the Cross and Resurrection for the sake of the world. This is a favorite passage of mine, because in it, Balthasar ties Christian theology to the life of the Trinity. For Balthasar, creation itself is seen as an over-pouring of Trinitarian love, in which God creates and gives of himself to free agents. Creation, for him, is “a new ‘kenosis’ on God’s part, since he is thereby restricted, implicitly by creaturely freedom and explicitly by the covenant with its stated terms”. In giving implicit freedom, and explicit covenants, God is thereby binding and limiting himself (even limiting his own freedom) to his creation. Thus, the creation is an act of self-giving love from an overflow of the Trinity itself! On a deeper level still, the cross is an expression of Trinitarian kenosis; because in the cross, Jesus pours himself out — he empties himself (Phil 2:7) — on behalf of mankind. He gives himself as a sacrifice for the sin of mankind, which is a pleasing aroma to the Father (Eph 5:2). Balthasar explains that the the Son’s surrender to death on the cross is a “representation of the Father’s trinitarian, loving self-surrender”. This fits especially with Christ’s words: if you have seen Me, you have seen the Father (Jn 14:9). Thus, when we look to the cross — this kenosis of Christ, this atoning surrender — we see the Father in his essence. And so, Trinitarian self-giving love — kenosis — is the grounding of all Christian theology!